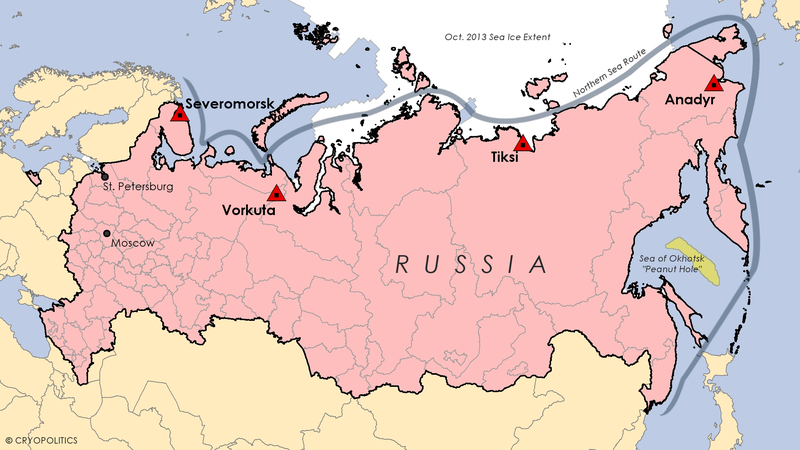 Military bases and airfields along the Northern Sea Route that Russia plans to restore. The newly acquired “Peanut Hole” in the Sea of Okhotsk is also displayed. 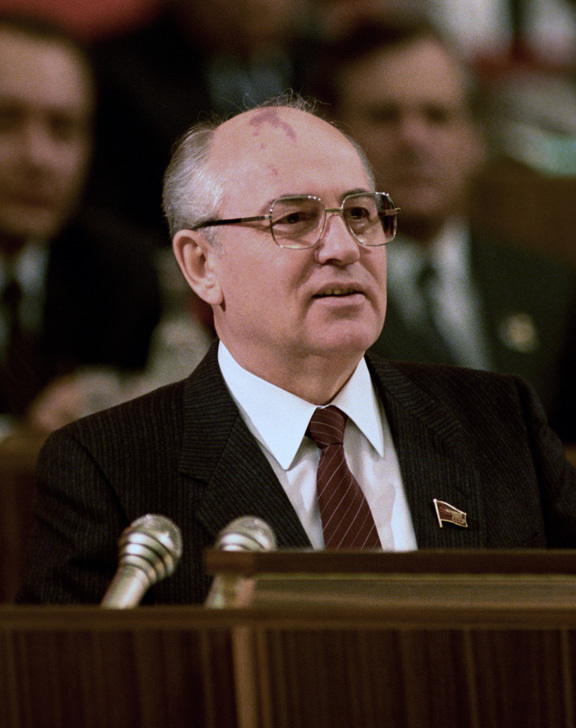 In October 1987, Soviet leader Mikhail Gorbachev declared, “The Soviet Union is in favor of a radical lowering of the level of military confrontation in the region. Let the North of the globe, the Arctic, become a zone of peace.” Today, news stories about Russian activities in the Arctic make that speech seem like a very distant memory. Russia Today triumphantly reports that Russian military bases will span the country’s entire Arctic coastline by the end of 2014, “just a year after Moscow announced its ambitious plan to build military presence in the region.” Defense Minister Sergey Shoigu claims, “By the end of the year we will already deploy most of our units in the region – from Murmansk to Chukotka.” Severomorsk, the city that is the headquarters of Russia’s Northern Fleet, will be the core of the new Joint Strategic Command along with the new strike force. Thousands of kilometers to the east, Tiksi, in the Sakha Republic, will serve as the base for Russia’s Arctic Air Force. Airfields are also reportedly being brought up to speed in Vorkuta, a coal-mining city in the Komi Republic, and Anadyr, at the country’s eastern edge. An article in another state-owned Russian news agency, ITAR-TASS, quoted President Vladimir Putin: “The fact that we restore it – what was lost. I’ll see,” referring to the restoration of all of these former Soviet military bases in the Arctic. This fixation with getting back what the Soviet Union once had, from Crimea to Arctic military bases, is no passing fancy of the Russian leader. A map of Soviet naval bases on Wikipedia, however, illustrates just how much work he might have cut out for him in returning Russia to a Soviet level of military presence in the Arctic, as the USSR invested a significant amount of money and resources into constructing military bases. Whether or not this military infrastructure is actually ever (re-)built in the Russian Arctic, the Kremlin’s plans fit into a longer history of Russian and Soviet desires to achieve “mastery of the North” (освоение севера) . The word “освоение” (mastery) can also be translated as “development,” meaning that the Russian language takes mastery and development to be one and the same. It’s therefore possible that a typical Russian perspective might not see an area as mastered or controlled unless it was developed – hence why, unfortunately, development would traditionally be preferred over environmental conservation in order to guarantee Russia’s sovereignty over its Arctic region. One exception to that, however, might be the news that the country’s Northern Fleet is planning to create an Arctic environmental center to monitor and improve the region’s ecological status. This represents, in effect, the militarization of environmental protection in the Arctic. “It is enough to note, that the Arctic Ocean washes the whole of the northern part of the sovereign shore of Asiatic Russia and represents the single open ocean connecting our far eastern possessions with European Russia” . One hundred years later, nothing has changed. The Achilles’ heel of Russia’s vastness is that it has always struggled to knit together its enormous territory, causing an obsessive and defensive attitude in Moscow as it attempts to achieve this.The development of the Northern Sea Route can be seen as a maritime counterpoint to the land corridor that some commentators believe Russia yearns to establish from the mainland to the newly annexed Crimea. Development of the Arctic shipping lane would connect western Russia, where the bulk of the population lies, to the country’s newly acquired, resource-rich territory in the Sea of Okhotsk – 52,000 square kilometers of ocean space and seafloor, sometimes referred to as the “peanut hole,” that the United Nations designated as part of the country’s continental shelf this past March in a ruling that slipped under the radar as the conflict in Ukraine was boiling over . Russian state-owned media: speaking too soon? As a state-owned media outlet, RT could possibly be overstating the extent of Russia’s drive into the Arctic. Someone once mentioned to me during a conversation about Russia’s plans to build ten search and rescue stations along the Northern Sea Route: “When Russia says that something is under construction, that means it’s still in the planning stages. When they say it’s been built, that means its under construction.” In other words, news coming out of Russia might be one step ahead of the game. Similarly, in describing the plentiful oil and gas resources located in the Arctic, RT mentions how “as technologies have advanced, more and more of those hydrocarbons have become recoverable and viable.” They conveniently forget to note how Western-imposed sanctions have made those very hydrocarbons less recoverable and viable. Earlier this month, for instance, despite the fact that ExxonMobil and Rosneft struck oil in the first well they drilled in the Kara Sea, the American oil major was forced to withdraw due to sanctions, putting the project on thin ice even as Rosneft vows to carry on. RT also tries to put the militarization of the Arctic in a good light. “Despite concerns from environmentalists,” the story explains, “Shoigu said that the military would play a positive role in safeguarding the unique Arctic environment, and said that units are already engaged in a program of clearing up debris “that has accumulated for centuries.” But where did that debris come from? Largely, military activities in the Arctic. A single storage facility on the Kola Peninsula holds some 20,000 discarded nuclear fuel rods from nuclear submarines and nuclear-powered icebreakers. This debris isn’t just a Russian problem: Alaska, for example, has 700 military sites, many of which have been abandoned, while the Cold War-era Distant Early Warning Line has also left its mark across much of the North American Arctic and Greenland. An article in The Barents Observer highlighted how Putin stressed that militarization would not harm the ever-iconic polar bear. But even if military activities do not directly impact polar bears, militarization of the Arctic will. Polar bears are a circumpolar species that requires international cooperation for protection. In fact, one of the first major circumpolar Arctic treaties was the Agreement on the Conservation of Polar Bears, signed in 1973 by Canada, Denmark (Greenland), Norway (Svalbard), the Soviet Union, and the United States, and it is still in effect today. But when militarization heats up in the Arctic, countries lose the motivation to work towards international environmental agreements. On that cold day in Murmansk so many Octobers ago, Gorbachev encouraged military détente in the Arctic. Today, as an alleged Russian submarine idles in the Gulf of Bothnia somewhere off Stockholm, one wonders what the former world leader, now spending his days in Moscow, must think of the situation in the circumpolar north. If nothing else, let’s hope he’s popped in an old VHS tape of The Hunt for Red October. For more on this concept, see John Tichotsky’s book, Russia’s Diamond Colony: The Republic of Sakha (2000). For a deep analysis of the ruling and its implications, see John R. Haines’ article, “Ali Baba’s Cave’: The Sea of Okhotsk’s Contentious Triangle” (2014).